Boost and developed your E-commerce and business sites with this Business Hosting. Buy 25 GB Recommended For Photos And Music Memory for backup and safe your data from unexpected lose. Protect your personal website with this Protect One Website DV, OV & EV SSL Certificates and get 20% off on it. Is WordPress hosting better than the shared web hosting plan? If you have a WordPress website then going for the WordPress hosting plan would be better than opting for a shared hosting plan. GoDaddy shared hosting plans are great too but their WordPress plan is designed specifically for WordPress which means you will have services and tools optimized for this platform. 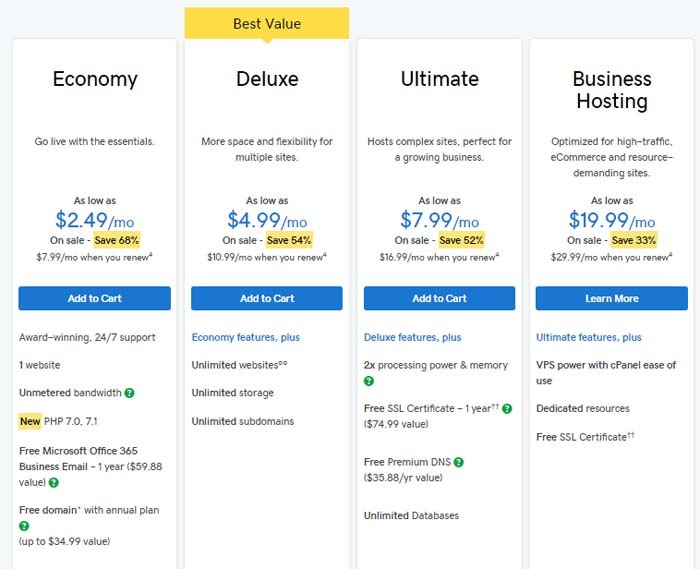 There is not much price difference between the two types of hosting, especially if you use a discount code. The core features and support is basically the same, however, WordPress hosting will give your website more resources and support. Hosting WordPress website at GoDaddy ensures that all your applications are up to date and data is backed up. Are coupons valid only for the first term? Does GoDaddy offer renewal coupons? Yes, the coupon you used when signing up for the first time is only valid for the first term you selected (1 year, 2 years, or 3 years). Once the first term expires, the plan will be renewed at the regular rates. 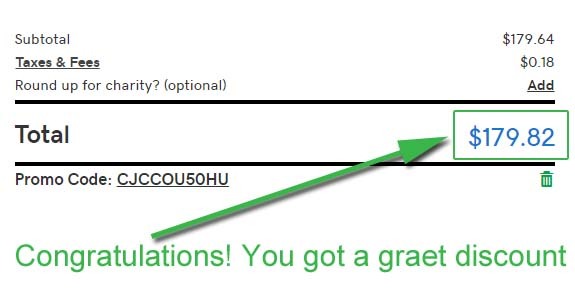 However, the good news is you can also find GoDaddy renewal coupons. In most cases, you will end up paying the same price you paid earlier with discount. 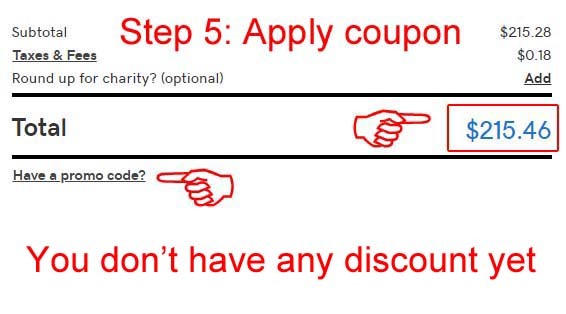 However, renewal coupons not as abundant as new plan sign up coupons. GoDaddy is the leader of cloud platform for domain registration and hosting among other solutions for web businesses. With round the clock customer support, great discounts, and plethora of online resources for the customer, GoDaddy is the number one choice for small independent as well as established businesses. Their plans and prices are designed to provide growing businesses an opportunity to gain solid ground in the online world. There is something for everyone and at prices that never put a dent on your budget. Something as fundamental as a domain name should not be difficult to get and expensive to buy. They have over 76 million domain names under their belt. This is the cheapest plan starting at just $2.49 per month after discount. With this plan you get: 1 website, unmetered bandwidth, free Office 265 business email, and free domain (up to $34.99 value). This Linux plan is best for new businesses who are just establishing their online presence. Deluxe plan is their best value plan as it is super cheap but offers even more benefits than the Economy plan. Starting at $4.99 per month after discount, this plan takes your business to the next level. 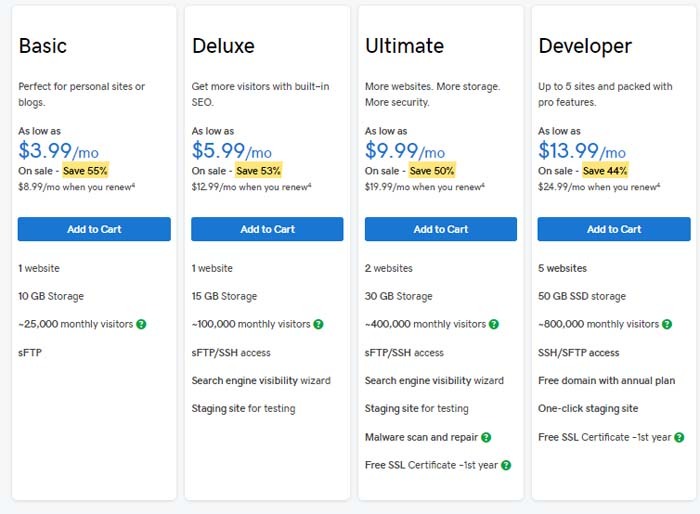 In addition to all Economy features, you get unlimited websites, unlimited storage, and unlimited subdomains. 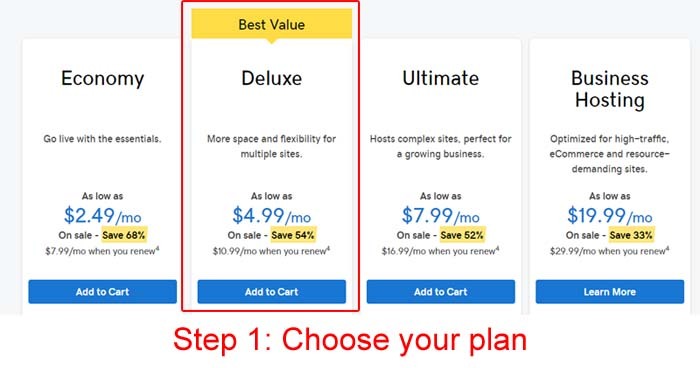 The Ultimate plan is more expensive than Deluxe but still easy on the pocket. After discount, it is only $7.99 per month. Additionally, you get twice the processing power, free SSL certification for your website, unlimited databases, and free premium DNS. Websites that require more resources and handle high traffic should go for the Business plan. This plan is $19.99 per month after discount. It is secure, fast, and easy to manage. You almost get VPS hosting level power even though you are sharing the server. The best thing about the Business plan is that you get dedicated resources and free SSL certification. WordPress is used by tens of thousands of bloggers and businesses for many reasons. If you want to create a WordPress website or move an existing one, GoDaddy WordPress hosting has much to offer. You can sit back and relax while your WP website thrives and GoDaddy takes care of everything for you. The Basic plan is ideal for blogs and personal/branding websites. The plan is only $3.99 per month after applying the discount code, one of the cheapest in the market for WordPress. You get 1 website, 10 GB storage, and sFTP. This plan is great for blogs/websites with 25,000 monthly visitors. The Deluxe plan also offers 1 website but with bigger storage (15 GB). With sFTP/SSH access, this plan is $5.99 per month after discount. You also get Search engine visibility wizard and Staging site for testing. The Ultimate plan is an extension of the Deluxe plan and packs more power and possibilities for a CRM as simple as WordPress. You get 2 websites for $9.99 per month with this plan. With 30 GB storage, this plan is good for websites with 400,000 monthly visitors. In addition to all the Deluxe plan features, you also get Free SSL certificate for 1 year, and Malware scan and repair. This plan is designed for developers who have a knack for WordPress. You get up to 5 websites with 800,000 monthly visitors. It comes with a whopping 50 GB SSD storage. You also get free SSL certification for 1 year and free domain with the annual plan. All of these robust professional features are offered at a discounted rate of $13.99 per month. Like most hosting websites, GoDaddy offers multiple VPS hosting plans for high traffic websites. There are 4 Linux plans under VPS hosting. All the plans have such features that provide the control right in your hand. You get standard managed services, amazing processing power, scalability, and much more. There are three levels of management that you can opt from based on your business needs: self-managed, managed, and fully managed. All VPS plans are great for e-commerce, storefront, and media websites that deal with heavy traffic and huge amounts of content. The extreme type of hosting from GoDaddy that gives you full access and flexibility is the Dedicated Hosting. You can upgrade anytime as and when your business requires. 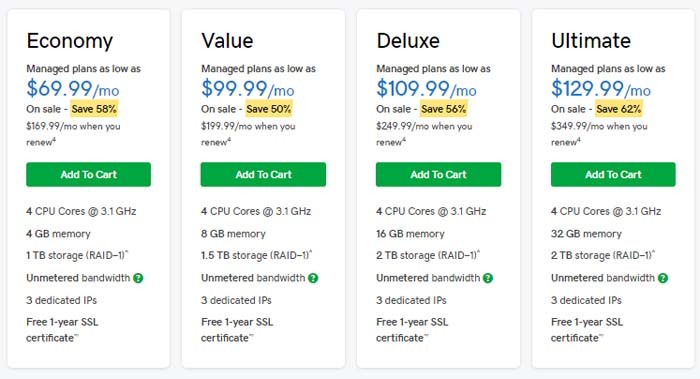 Dedicated hosting is generally the next logical step to VPS hosting and with varied plans, competitive prices, and crazy discount coupons, GoDaddy is the choice of many. They offer RAID 1 storage with their dedicated hosting. 1. First of all, choose the plan that is appropriate for your website. 3. Now you will be asked to enter a domain for your free domain that comes with the package. You can get a new domain or skip this step if you have one already. 4. If you chose to use the free domain, you can select it and continue with the subscription process. 6. Your discount code will be applied and the discount will be reflected in the payment details.